Japan's first cargo-carrying freighter was set free from the International Space Station on Friday, beginning its new role as a garbage scow loaded with 1,600 pounds of trash from the complex. Under the control of Canadian astronaut Bob Thirsk, the outpost's robotic arm unberthed the H-2 Transfer Vehicle from the Earth-facing port of the station's Harmony module at 1502 GMT (11:32 a.m. EDT) Friday. After maneuvering the bus-sized spacecraft to a deployment position less than 40 feet below the station, flight engineer Nicole Stott took over command of the arm and released its grasp on the HTV at 1732 GMT (1:32 p.m. EDT). The 33-foot-long, 14-foot-wide cargo ship fired its thrusters four times after being unleashed, guiding the barrel-shaped spacecraft below and ahead of the station over the next couple of hours. Three much larger engine firings are on tap Sunday to slow the craft's velocity, allowing it to drop from orbit and re-enter Earth's atmosphere. The first burn is slated for 1455 GMT (9:55 a.m. EST), followed by another maneuver one orbit later at 1625 GMT (11:25 a.m. EST). A final de-orbit burn is scheduled for 2053 GMT (3:53 p.m. EST) Sunday. The engine firings will slow the HTV by 199 mph. The garbage-filled HTV will succumb to a fiery re-entry around 2125 GMT (4:25 p.m. EDT). Most of the spacecraft should be destroyed, but a few surviving pieces could fall into the South Pacific Ocean about halfway between New Zealand and South America. 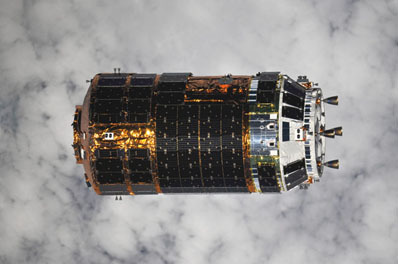 Friday's departure from the station ended a 43-day stay of the HTV at the complex. The ship arrived at the outpost Sept. 17, about one week after launching aboard an H-2B rocket from the Japanese spaceport on Tanegashima Island at the southern flank of the country. The HTV came with 5,475 pounds of supplies in its pressurized compartment. The cargo included food, computers, experiments, crew provisions and other maintenance items. Station residents finished unpacking the gear about two weeks ago and began putting trash into the ship. Two science payloads were tucked inside the craft's exposed section. The Japan Aerospace Exploration Agency's SMILES experiment will detect trace gases in the ozone layer using a submillimeter sounder. The 1,047-pound instrument will help determine the extent of human activity's affects on ozone. Both payloads were mounted on a platform that was removed from the HTV by the robot arm and temporarily replaced on the station in late September. Each experiment was transferred to the station's external science deck and the carrier was put back inside the HTV for the rest of its mission.